As my body was burning, I could not stop crying. It was the most agony I had ever felt. More emotional turmoil than I knew was possible was pumping through my arteries. As my stomach churned in anguish I was unable to eat or sleep. This was my most dreadful, lowest point in life. My project and financial support was stripped from me. My Guru, who is my life and soul, the most important person to me, had just departed from this world. The only girl I had ever had a relationship with, and that I loved fully, had moved on. Due to my conscious choice to defy social expectations, rumors were rampant, and I felt shunned, rejected, and unloved by the spiritual community I had lived in for my entire life. I had nothing. Everything I had created was lost. I lay there alone. I wailed and screamed in pain. My heart had been grated into shreds. I laid melting in a box, hungry, with no fan during the center of summer, in the hottest habitable place on planet earth. At this low point, I had to decide: What was I going to do? Who was I going to be to get out of this pitiful mess? I had studied the law of attraction, but it seemed to only attract pain. I tried to be present in the moment, but all the moments of that time were torturous. Affirmations felt like fibbing, and business books did not help. I had studied all the self-help work, but still, it simply did not work for me then. In truth, this period of persistent pain was one of the greatest blessings of my life. It put me in a situation where I had to clearly choose: did I want to live my Eternal Dharma? Did I want to take the risk of Spiritual Surrender and apply all the 5,000-year-old spiritual wisdom that I had been trained in for my entire life? Or, did I want to give it all up and move forward without giving credence to the spiritual domain? I chose Dharma. I chose to surrender—to surrender fully, with no hope or expectation, just to surrender in love—and magic began to unfold! You see, there are different qualities of spiritual action, and although I had been trying to serve and surrender spiritually for the majority of my life, this time, due to the intensity of the situation and where I was in my spiritual evolution, I surrendered in a way that I had not done before. I gave up all other hope, backup, or plan. I gave up any expectation of societal approval and acceptance, and even any expectation of my basic human needs of food, shelter and connection. I simply offered myself to the divine through the peaceful intensity of Dharmic action, and this is when the magic of Spiritual Surrender really began to flow. This time around, the choice to surrender was especially significant. It was a choice to live my full Dharma, and in a sense it knocked me out of my previous fairytale-like life. 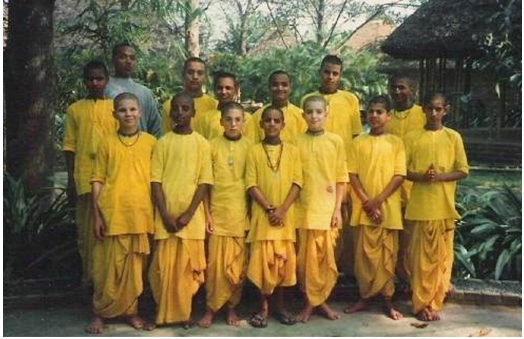 You see at the age of 11, I moved into a monastery in India. It was off in a distant Eastern land. We lived in mud huts with thatched roofs, and the grounds had lush gardens that bloomed with tropical flowers. These gardens were embellished with large quartz crystals and colored stone that pulsated with a flare of Eastern design. Mango, banana, and palm trees covered the land, and everything seemed complete. We even had a pet elephant (who disrobed me once, but that’s a comical story for another time). Thousands gathered to view our weekly ceremonial processions, which included dance with music, elephants, fireworks, and mystic rituals. We woke daily at 2:45 a.m. to start meditating, perform ancient spiritual rituals, and vibrate spiritual sound in song. Every day we rigorously studied and memorized the ancient Vedic texts which embody the 5,000-year-old spiritual wisdom of India. This was the context of my childhood and teenage years. Later, after this experience, I traveled under the direct guidance and mentorship of my Guru; Srila Bhaktivedanta Narayana Goswami Maharaja—one of the greatest bhakti-yoga masters of our time. He bestowed upon me the greatest honor by making me the youngest swami, aged only 23. 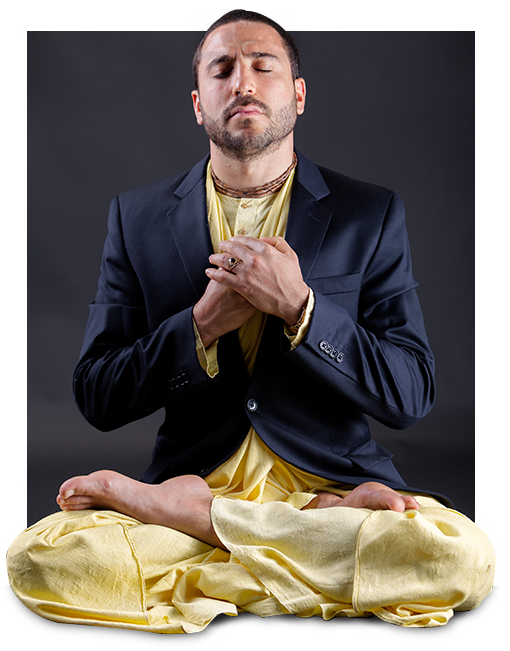 A swami is the most revered monk authority position in the spiritual traditions of India. He sent me to teach on 5 continents, in 20 countries and 80 cities around the world, and crowds as large as 15,000 would sometimes gather to hear me speak. In this way I have taught internationally in various places including Universities, five-star hotels, million-dollar condos, and even in simple village mud huts situated in the world’s most likely place to be eaten by a tiger. However this would not do. Simply having pretty gardens, an elephant, 5,000 years of wisdom, and a large international audience was not enough to convince me of the validity of this knowledge system. To this day I am shocked how people can so quickly and easily accept a way of thinking without challenging said ideals and seeking verification. For the 20 years of my monastic training I did two things: I simultaneously followed, practiced, and served with all my heart, soul, body, and mind, while at the same time I challenged and tried to find any weakness or falsity in each teaching. Life is not cheap, I only get to live this one once, and it shall not be governed by arbitrary ideas, rules, or expectation of a bound society; I want only heart-quenching eternal truth. Therefore, my continual ideological challenging, combined with sincere spiritual exploration and practice, let me shed much of tradition, mental fabrication, and the customs that are often taught as spiritual truth. At the same time I got to cultivate a powerful spiritual connection with the Divine. But still, even though internally I was detached from tradition and culture, I was bound to it. I had a societal role to play and I was comfortable. My ego was big and because of this I was losing my connection with the Divine. The low point in my life, during which I felt immeasurable pain, is what gave me the wake-up call to only accept what I found to be spiritual essence, while at the same time giving less credence to the customs and traditions and societal pressures that often accompany any spiritual or religious teaching. This is one of the reasons why I am now known as the Maverick Monk; I simply teach what I have found to be essential spiritual truth and thus I don’t represent any church, religion, cult, or institution. Since becoming a ‘Maverick’ I have been teaching my ancient, yet fresh approach to life, spiritual growth and personal transformation. Such teaching has lead me to again share wisdom internationally and speak at amazing events, such as the first personal growth Carnegie Hall/Hotel Pennsylvania event. I have been fortunate to share the stage with many legends such as Les Brown, Bob Proctor, Michael Beckwith, Mary Morrissey, Kevin Harrington (the original shark from Shark Tank) and so many others. I am humbled at the thought of this all and I am grateful that my book Eternal Dharma is represented by the same agent as Eckhart Tolle. When thinking back on the journey, I am in awe of how the Divine has arranged for me, a simple truth-seeking boy, to journey to so many places. In this voyage of life God has not only enabled me to rigorously explore personal growth and Passionate Enlightenment, that ever-sweet Lord has also arranged for me to travel through quaint mud huts in the villages of Bengal, to the magnificent auditorium of Carnegie Hall in downtown Manhattan and everything in between. Such a trip has enabled me to meet so many interesting and inspiring people and I would like to meet you next. My friend I would be honored to know you and share with you some of what I have learned. 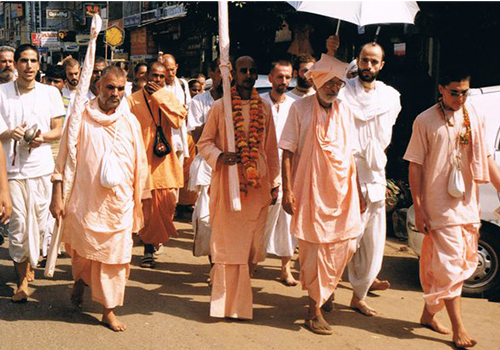 Vishnu Swami–The Maverick Monk PS. Here is the link again to my special web-class, you’re going to love it!